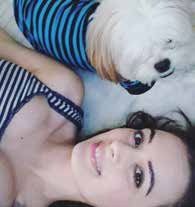 Evelyn Sharma, Indian-German model and actress who made her Hollywood debut in the film Turn Left (2006) and came into limelight in India with the film Yeh Jawaani Hai Deewani (2013) opposite Ranbir Kapoor, is truly, madly and deeply in love with Buchki, her three-year-old Lhasa Apso. In the filmdom, Evelyn has received a lot of admirations for her commendable performance in a handful of Bollywood films, such as Nautanki Saala, Issaq and others. In 2014, her role of Janet D’Souza in Yaariyan was widely acclaimed. She was spotted doing a cameo in Imtiaz Ali’s rom-com Jab Harry Met Sejal. Evelyn will be seen playing lead in Jack and Dil, opposite Amit Sadh of Kai Po Che fame, which is set to be released later this year. When asked about her first pet in her childhood, Evelyn says she had a gold hamster when she was a little kid.”The hamster was the cutest little thing and I used to care for her all afternoon after school, build little castles and tunnels for her and feed her strawberries, which were her absolute favourite. When she passed away I was terribly heartbroken. I simply didn’t understand that the life span of a hamster was naturally only 2-3 years,” she recalls. After the gold hamster died, Evelyn’s neighbours gifted her a blue parakeet who was lovely and cheered her back up, until one day the bird just flew out of the window. “I guess you can’t cage a bird!” she says. To have a sneak peek into her love life, Evelyn is head over heels with Buchki. She’s is completely in love with this Lhasa Apso. Evelyn’s love and affection for her adorable furry boy is known to all who know her personally. 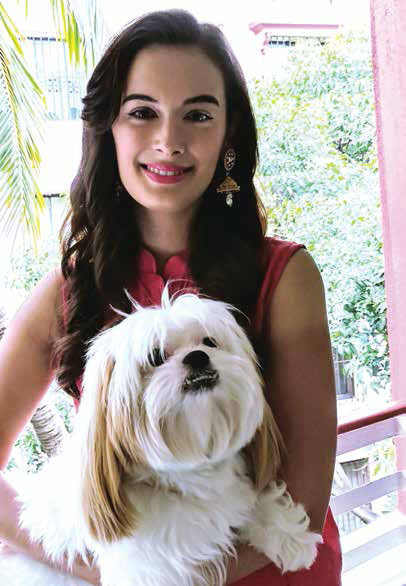 From constant updates on social media to majoring supporting animal welfare, this Indo-German beauty is all for her four-legged companion. Buchki is often spotted with her at various events. The perky pooch is the apple of her eye. She has even called Buchki her ‘best friend’ in one of the recent interviews. Since the day Buchki came to her, Evelyn considers him as an inseparable part of her life. Like any other pet parent, Evelyn too loves being greeted by her pet after a long working day. Exercise and nutritional needs of her pets are taken care of by Evelyn herself. “My cat Luii likes to sleep a lot so for her when she wakes up chasing Buchki around the house is her own workout! For Buchki, besides chasing Luii, he walks three times a day round the neighborhood and is obsessed with playing fetch around the house.” Luii is sweetest to Evelyn when she takes out a packet of wet food. But Buchki just wants anything that’s from her hand, without caring much what it is! He’s not a big eater, he just wants whatever Evelyn gives him. Mentioning a special treat for him, Evelyn says he has quite the big teeth, so bones to crush and chew on are his favourite treat and time pass! Annoying habits: Luii likes to play at night. Qualities you love: The soft- hearted character of my Bushki. Funny/crazy antics: Luii likes to throw around my hair bands for hours, it’s quite entertaining to watch! May the Force Be With You– Dogs in Security Forces Well-being Matters!